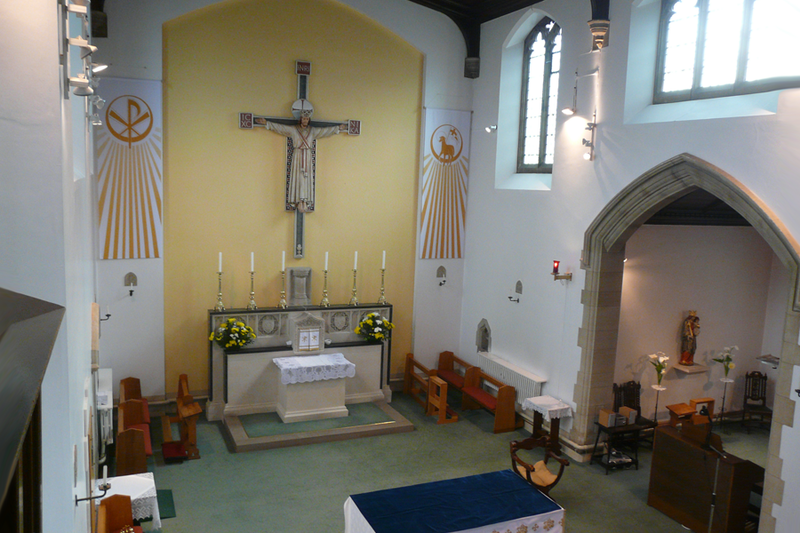 Our crucifix has a seating area for you to reflect when the church is closed. 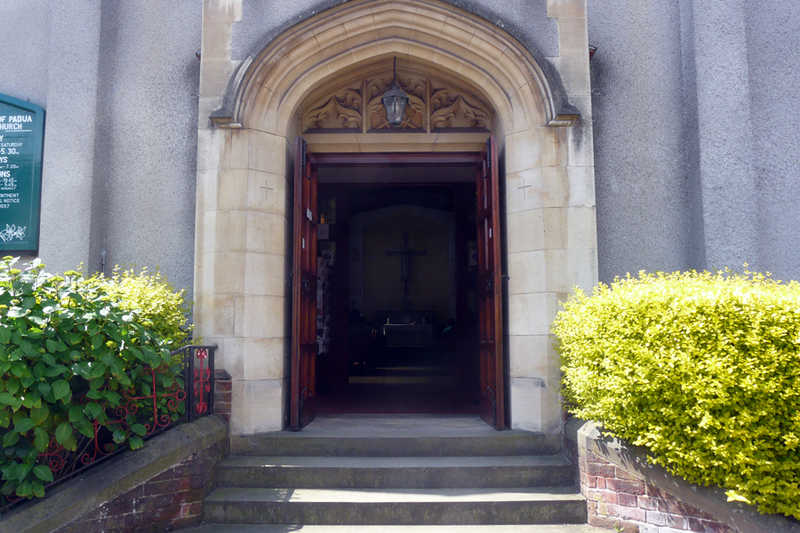 We have three entrances to our church. 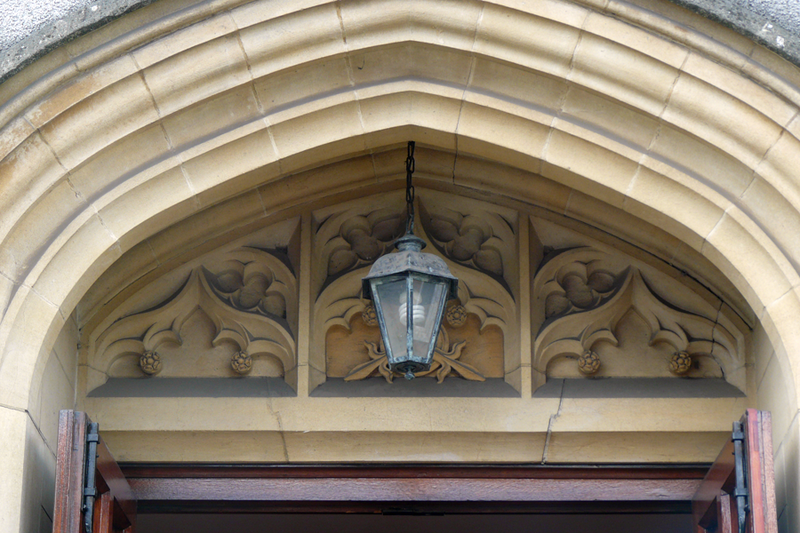 Find our beautifully carved fonts located by each entrance. Timeless, original features, carvings and sculptures. Established in 1878, revived in 1927 and consecrated on 14th June 1950. One of many original features include our proud church spire. Find us on Genoa Road in Anerley, SE20, South East London. Our beautifully woven tapestry, framed with love. 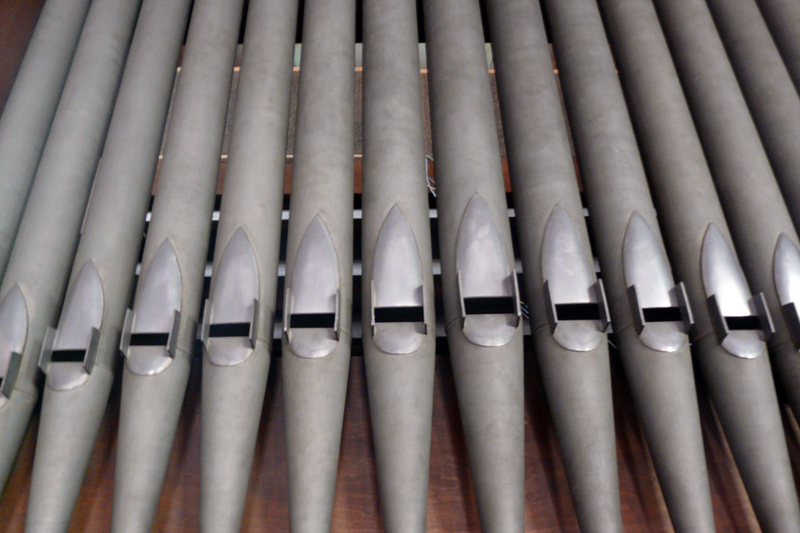 Our organ is played at the 9:30am and 11:15am mass every Sunday. 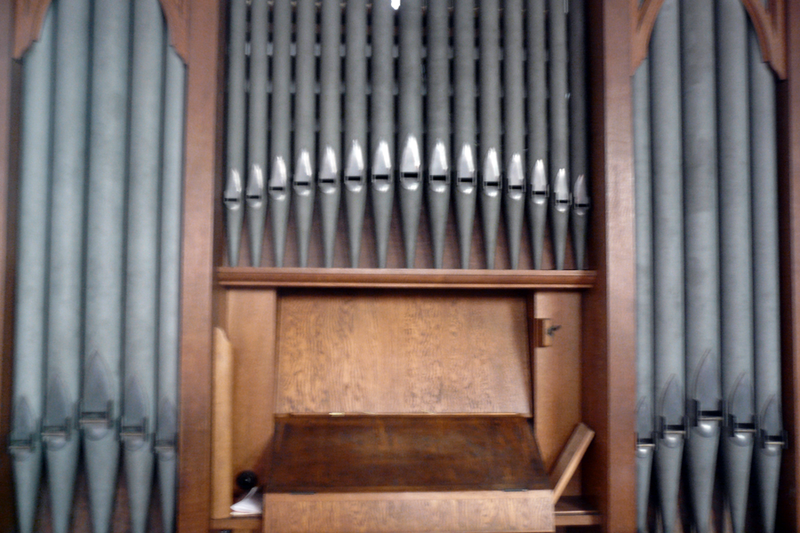 As tradition, our organ provides an authentic accompaniment to weddings and various other services. 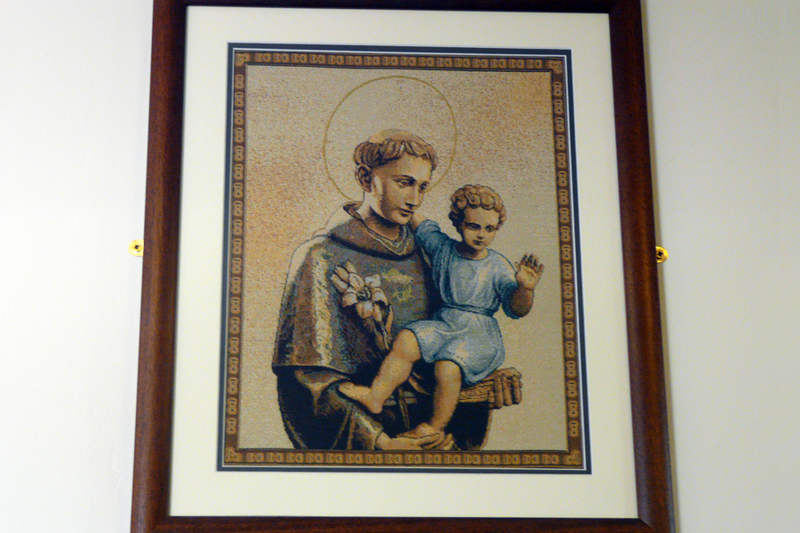 St Anthony; pray for us. Hand carved booth for readings, sermons and announcements. 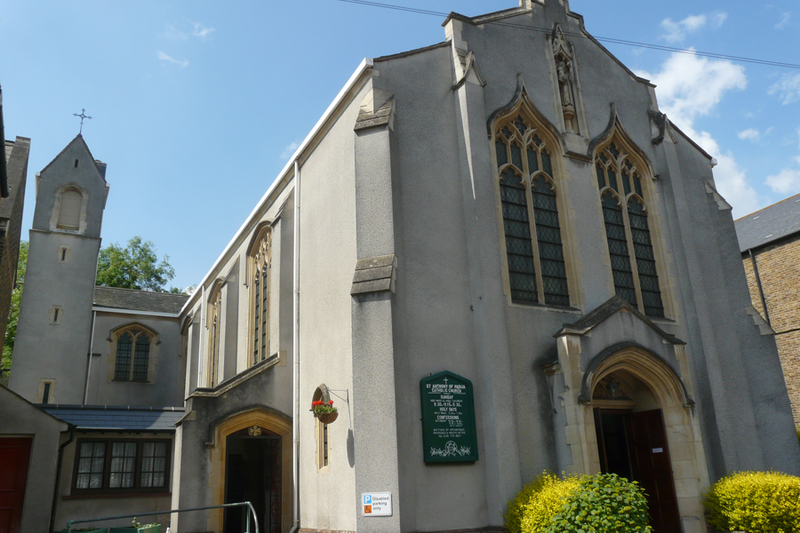 We have disabled parking facilities, a neighbouring car park and any vacant spaces outside the church. 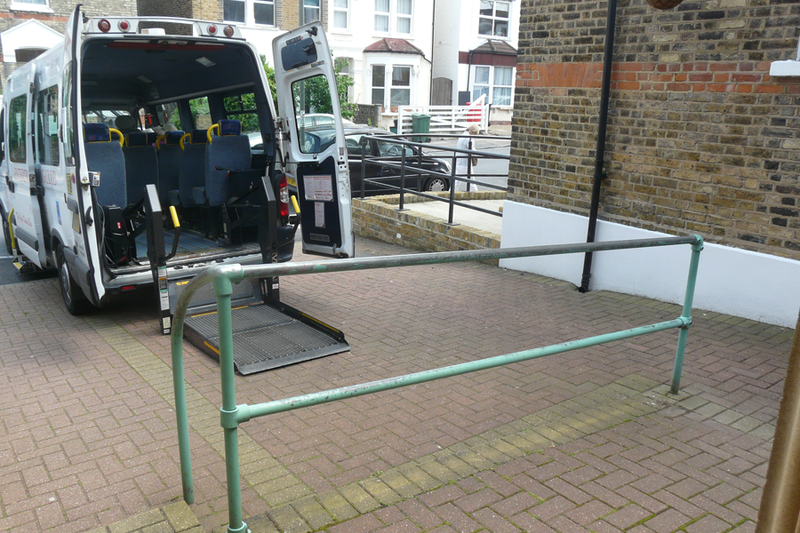 With a ramp for wheelchair access located by the entrance nearest The Presbytery. Please let us know if you require assistance visiting the church. We will endeavor to make arrangements. 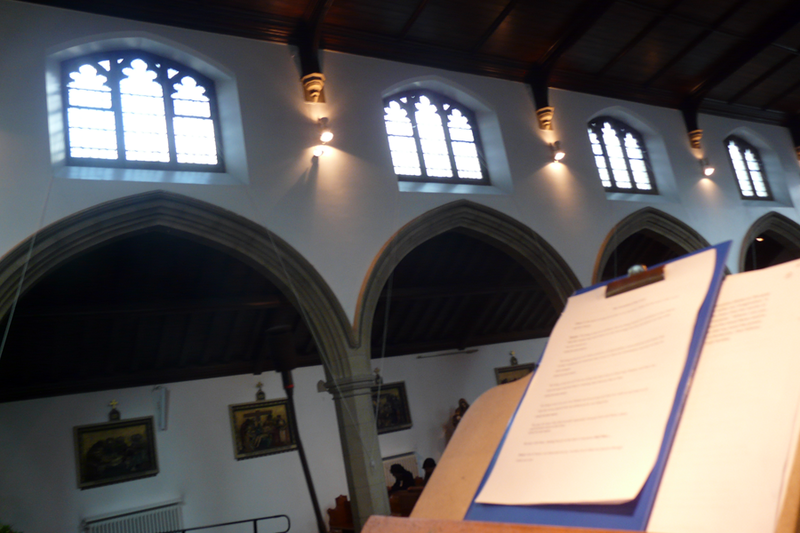 The balcony is home to our organ, it also provides an area for a choir or musicians performing at a service. 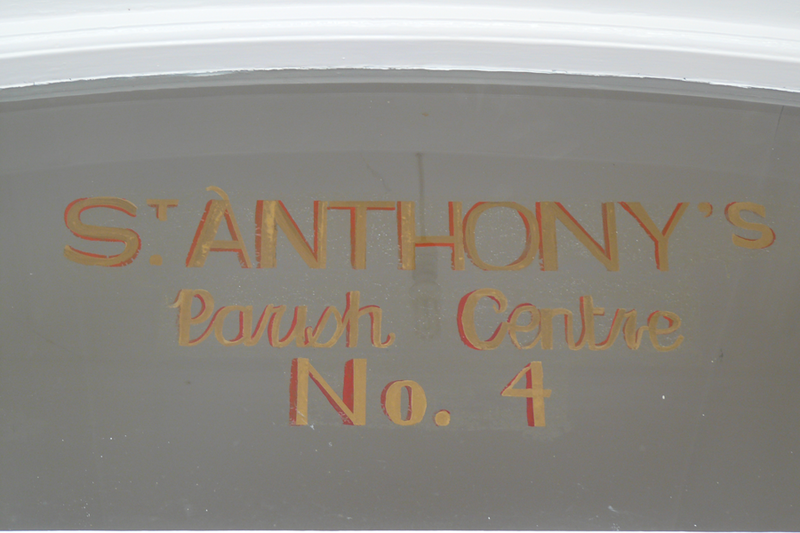 Find our Parish Centre next door to The Presbytery. 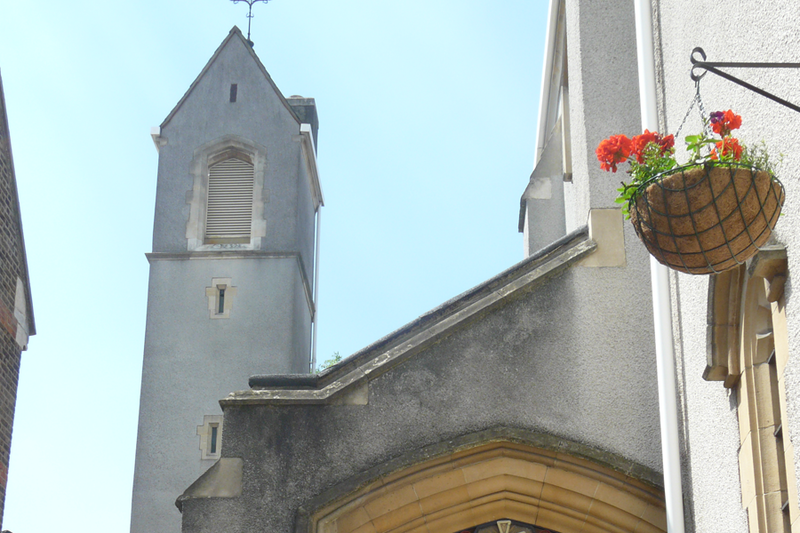 The Presbytery is situated between The Church and the Parish Centre. St Anthony of Padua is a Roman Catholic late Gothic Revival church of 1925-27, situated in Genoa Road, Anerley, South East London with daily masses. 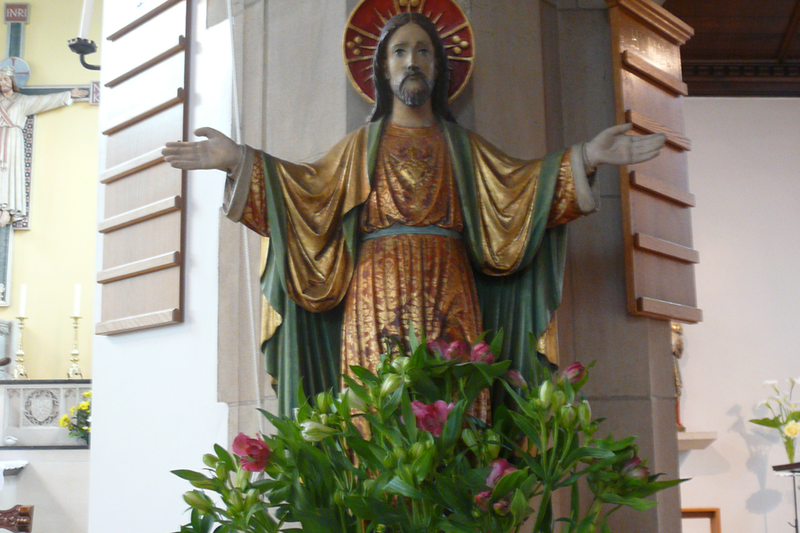 Special thanks to the Daughters of Mary of Joseph from West Wickham for kindly donating a beautiful crucifix which can now be found on our alter. Welcome to Celebration Church! 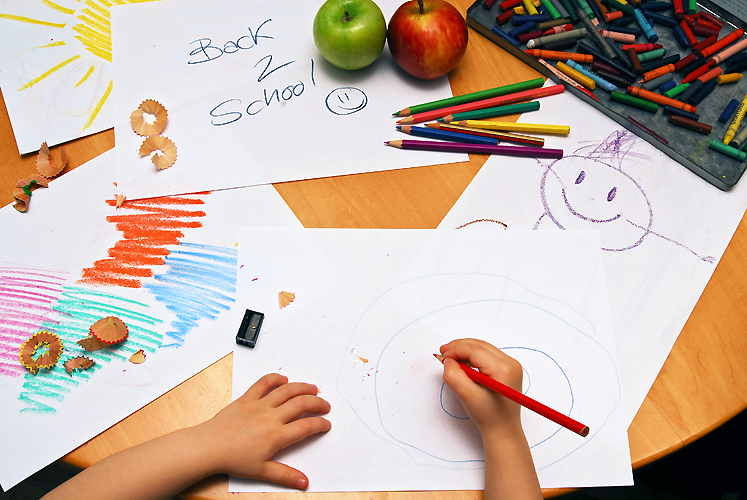 We encourage you to explore our site and take a look at everything we have to offer you and your family. We are confident that you will find Celebration to be a place where you can experience God and connect with others. Don’t hesitate to contact us if you have any questions. We would love for you to join us at any of our locations for one of our services through the week. and the gift of being one in Christ. For more information about the Parish, please feel free to contact the Parish Office via email at anerley@rcaos.org.uk or via phone at 020 8778 8597. If you are new to the parish then please complete a parish information form which can be found in the narthex (church entrance). This Parish was established in 1878 and in 1927. It was consecrated on 14th June 1950. Currently we are a multi ethnic community of approximately 800 parishioners. 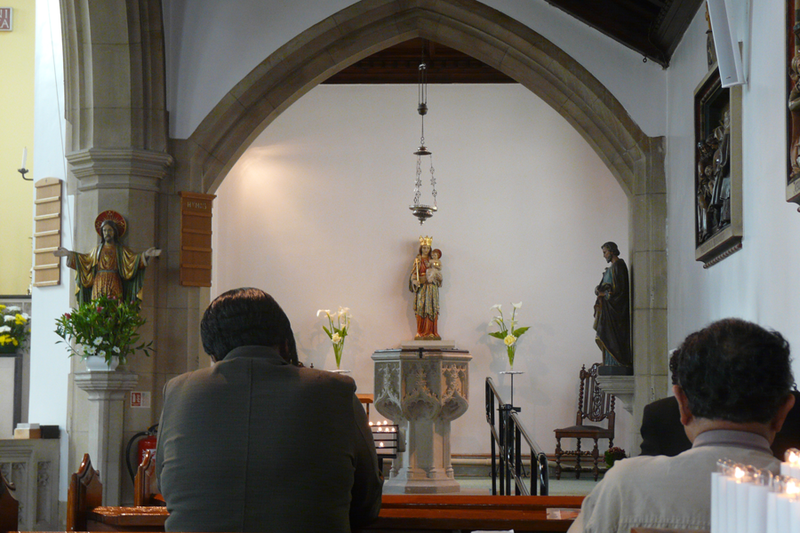 We are a registered Charity under the Archdiocese of Southwark. Our Parish Priest is Father Sunith Nonis. He joined the Church towards the end of 2007. 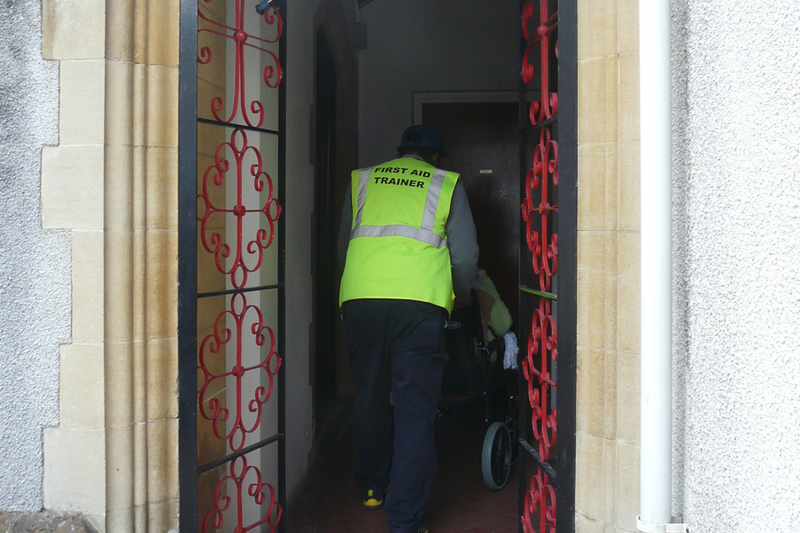 He is assisted in his Parish work by Father Stuart Meyer. A late Gothic Revival church of 1925-27 by F. A. Walters, whose son was the parish priest at the time. It retains several original furnishings. The predecessor building of 1898, originally housing school and chapel, survives beside it. 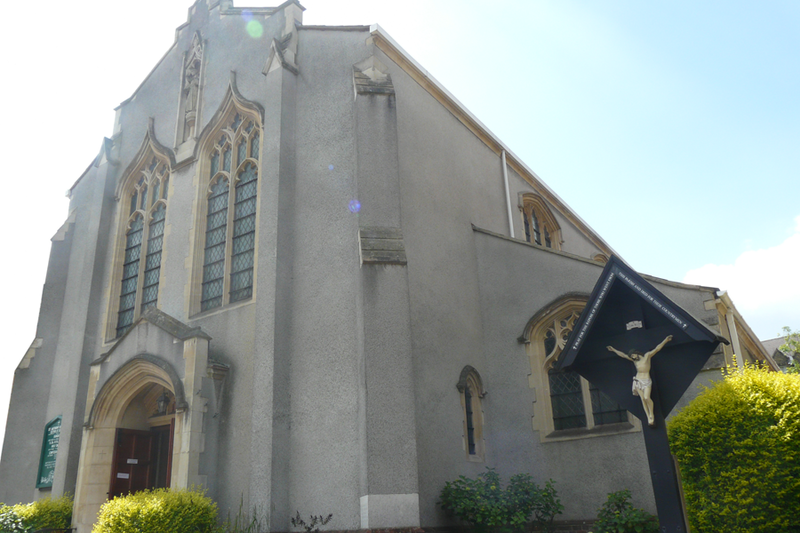 The mission at Anerley began with a fundraising appeal by Canon Bethell which raised £407 and allowed a small iron church to be built in Genoa Road on a site owned by the Canon. This opened on 25 October 1878. 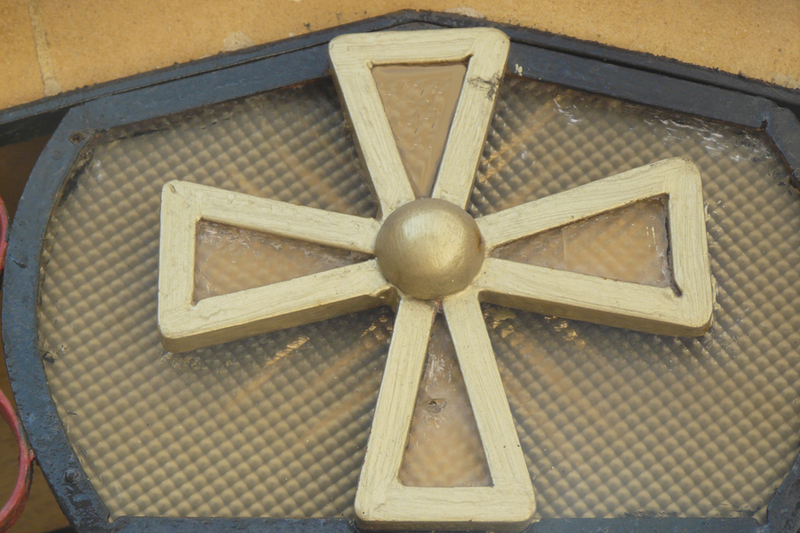 By the late 1890s the iron church was in disrepair and the mission priest Fr Miller began to plan for a replacement. He bought another site in Genoa Road for £230 and built a two storey school building whose upper floor was used as a chapel. The chapel was formally opened on 14 May 1898 by Bishop Bourne (later Cardinal Archbishop of Westminster). The cost of the building and its furniture was £2,653. In 1912 Canon Bethell died and the following year the presbytery and the site for the future church were acquired from his heirs for £700. The mission of St Chad, South Norwood, had been established in 1908, which was served from Anerley. This became a separate parish in 1919. Anerley itself became a parish in 1920. When James E. Walters became the parish priest in 1924, the debt had been cleared and there was enough money to start building a permanent church (including a gift of £3,000 from Miss Mary Murphy). Plans were drawn up by the architect Frederick A. Walters, the parish priest’s father. Building work started in November 1925. The builders were Messrs James Smith & Sons, Norwood. The foundation stone was laid on 28 March 1926 by Bishop Brown, Assistant Bishop of the Diocese. On Easter Monday, 18 April 1927 Bishop Brown formally opened the church. The cost of the church, which could accommodate 400 people, was £12,076. The high altar cost £234. 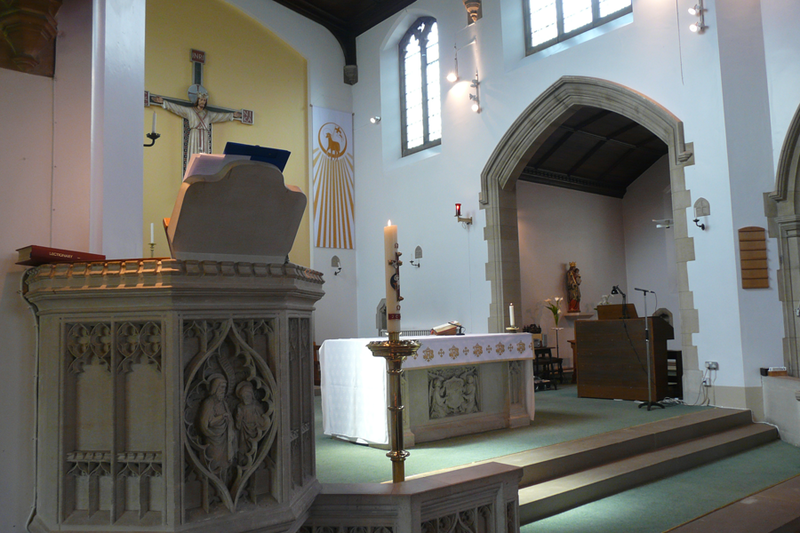 Some furnishings were donated in time for the opening, such as the painted stone statues of the Sacred Heart and Our Lady, and the font at the west end of the aisle. Other furnishings were acquired piecemeal over the following years, including the stone pulpit from Miss Koch (c.1929) and the organ, benches and altar rails. F. A. Walters had proposed a full-height reredos instead of an east window; however, this might not have been realised. He also proposed a three-stage tower at the west end with a parapet and spirelet and an attached apsidal baptistery; but this too was not realised – instead a smaller bell turret was built against one of the transepts. In 1936 Fr Bernard Wall became the parish priest (he later became the Bishop of Brentwood.) The church was consecrated on 14 June 1950. The predecessor of the present incumbent sold the church hall to the parish school, for use as the kitchen. On 13 June 2000, the feast of St Anthony, Bishop Charles Henderson, Auxiliary Bishop of Southwark, set a time capsule in the sanctuary’s north wall. The church is facing southwest; however, the following description will use the conventional liturgical orientation. The church was built between 1925 and 1927 to plans by F. A. Walters. The materials are brick and roughcast, with Bath stone dressings and a roof of Cornish Green slates. The style is later 15th-century English Gothic. The plan is longitudinal, with a lean-to south aisle and a north transept. The sacristy is placed to the east of the transept. The west face of the north transept has a small bell turret which also incorporates the chimney from the boiler room. In contrast to the interior, the west facade’s Gothic detailing appears rather thin. The central gabled doorway is set below two traceried ogee-arched windows. 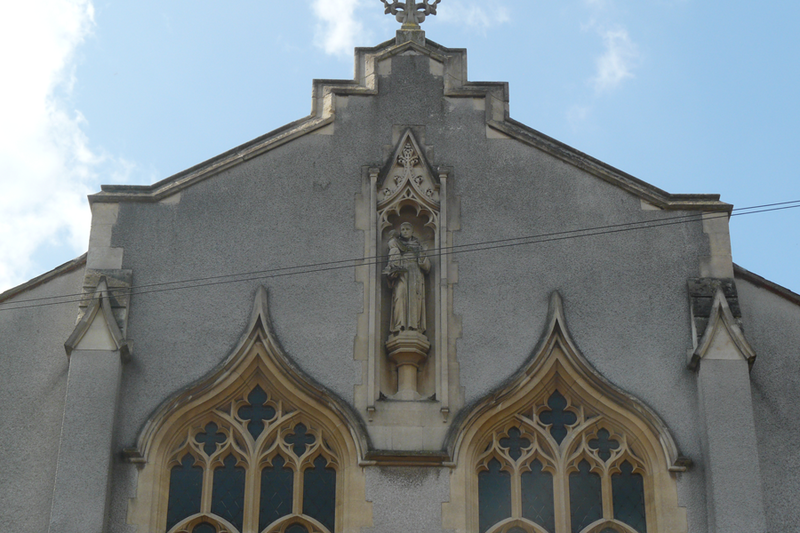 Above is a niche with a statue of St Anthony and a gable-end cross. This central section is framed by buttresses, with further diagonal buttresses on the outer corners. The west face of the south aisle has a two-light window. Access is via the west doors, a northwest porch (with ramp) or a door on the school (south) side of the building. At the west is a narthex with the repository at its north end. The nave has four bays, with a pointed arcade to the south aisle. On the south side of the nave are four three-light clerestory windows; with three three-light windows on the north side. Nave and sanctuary have a low-pitch timber ceiling. Beside the northwest entrance is a small bronze memorial plaque to the fallen of the First World War. The north side of the nave has a built-in confessional (with external access via a PVCu door) with a traceried timber screen to the nave. The north transept has an organ loft above a small chapel lit by a four-light window. 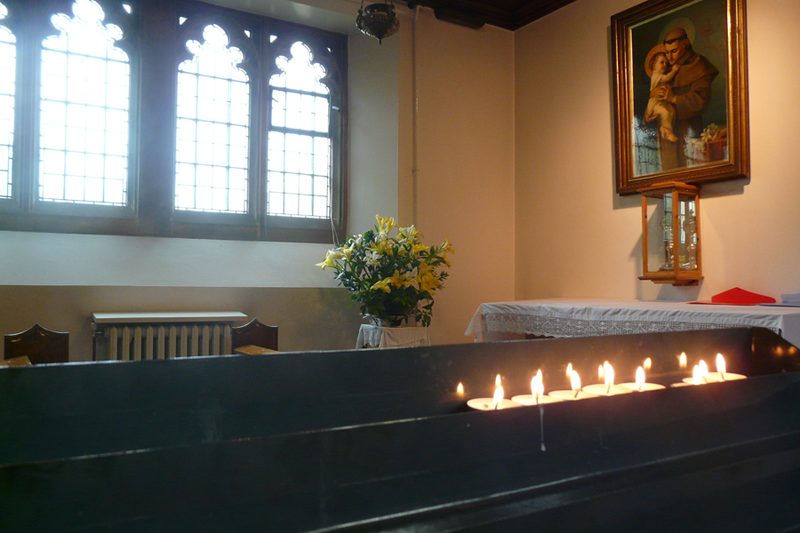 The chapel is dedicated to St Anthony, with a reproduction painting, a timber altar and a monstrance in a glass case. Beside the side altar is the door to the sacristy. The sanctuary is two bays deep, lit by two windows each on the north and south sides. High altar, forward altar, altar rails and pulpit are all of matching Seaton stone. The reredos of the original high altar is set against a shallow pointed niche, painted yellow. The reredos has four carved shields with the instruments of the Passion, with a monstrance throne above the tabernacle. The original altar was moved forward and replaced by a simple tabernacle stand in matching white stone. 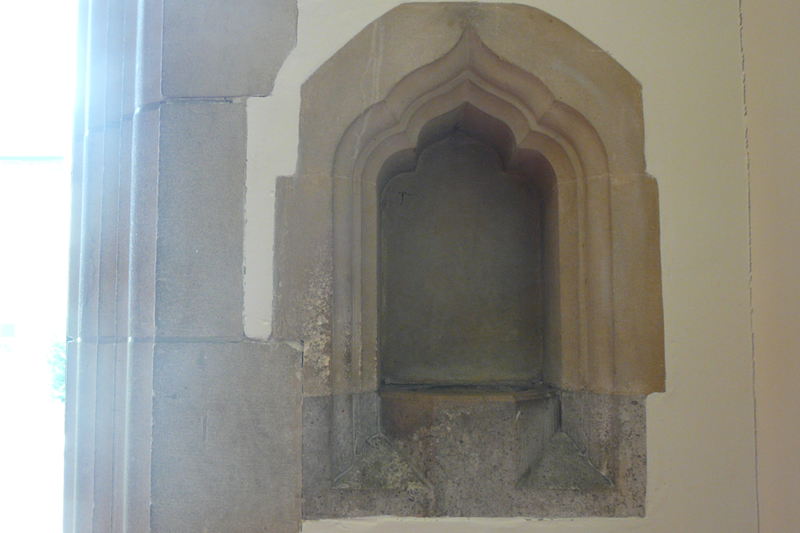 On either side are aumbry and piscina set into the walls. The altar has a carved frontal with two angels pointing towards a shield with the Blessed Sacrament and a mensa of dark marble. The altar rails (possibly shortened) are of Seaton stone, carved with pomegranates, a symbol of the Resurrection, and the IHS monogram. The stone pulpit is attached to the rails on the north side. It is octagonal, also of stone, with Perpendicular tracery carvings and a central scene of St John the Baptist and Christ. A small inscription in Latin dedicates it to the memory of Frederick Koch, who died on 4 March 1929. On the north side of the sanctuary is an enclosed niche with a brass plaque recording the placing of a time capsule in 2000. 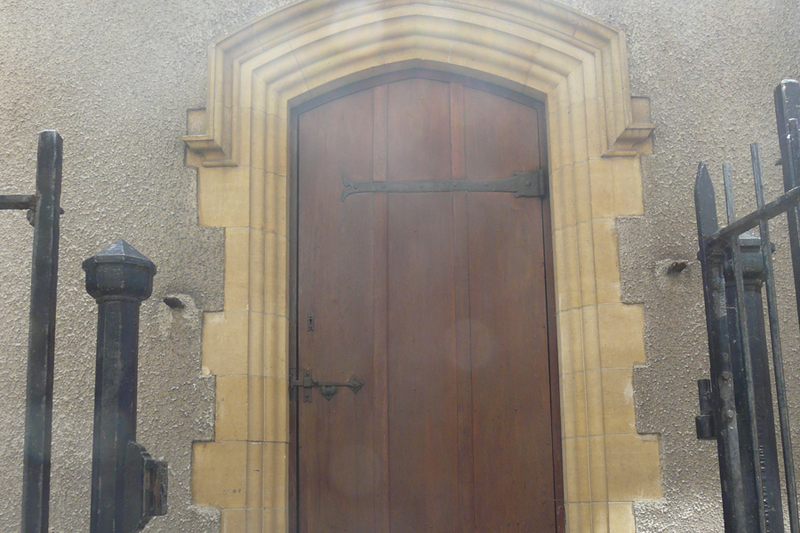 Further east is a door to the sacristy. On the opposite side is a large arch to the side chapel. The octagonal stone font with ogee-arch tracery is placed centrally in the side chapel, which has a three-light south window above a piscina. A statue of the Virgin with Child (c.1927) is set against the east wall, with statues of the Sacred Heart (c.1927) and St Joseph on either side of the chapel’s arch. The south aisle has no windows along its south face. A large Pietà sits on a pedestal painted with Marian symbols, an inscription (‘Mater Dolorosa ora pro nobis’) and diaper patterns. Two brass plaques dedicate it to the memory of Constantine and Philip Tomei, whose names recur on the First World War memorial. The west end of the aisle, beyond the southwest entrance, was originally the baptistery, with a piscina, aumbry and a carved timber panel of the Baptism of Christ. The Stations are large reliefs in rectangular frames set into the north nave and south aisle walls. The jewel in the crown of the attractive interior of St Anthony’s Church is its set of Stations of the Cross by the Catholic Flemish Sculptor Aloys De Beule, 1861 -1935. 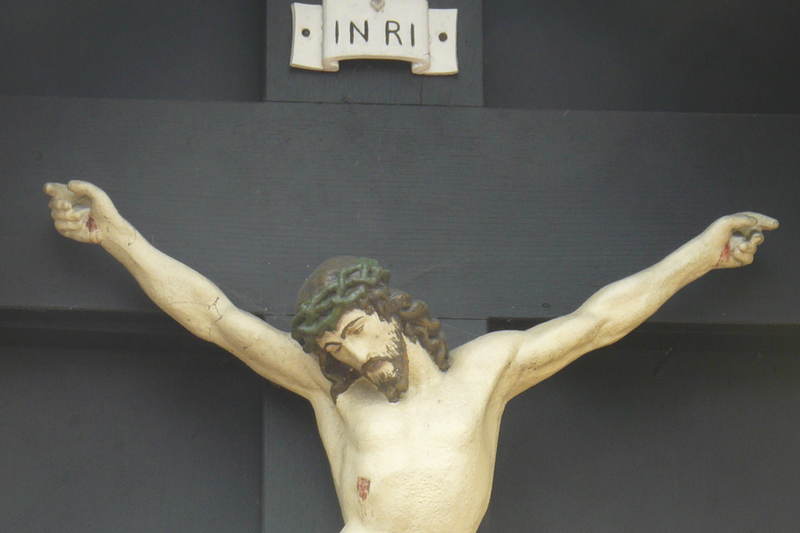 Indeed it is believed that there are only 3 sets of stations of the cross by De Beule of this size and style in this country. Each Station measures 4 feet by 3 feet and the figures are fashioned out of plaster. They were originally richly decorated but over time have suffered from a build up of grime and some of the figures now show considerable signs of the paint beginning to flake off. Towards the end of the Summer, this year, Fr Sunith and Fr Stuart decided that in order to prevent further deterioration, and to preserve this magnificent set of Stations for future generations, the set would need to be restored as a matter of urgency. A highly talented artist was found who agreed to undertake the work. When the project is completed the Stations will be photographed by a professional photographer and will be the feature of the parish’s 2017 Calendar.